TDA7294 is an integrated, monolithic, Class AB audio amplifier designed specifically for Hi-Fi applications. The IC has a DMOS output stage and can deliver 100W RMS into an 8Ohm speaker at +/-38V dual supply. The TDA7294 has low noise, low distortion, good ripple rejection and can be operated from a wide range of supply voltages. The IC has built in short circuit protection and thermal shutdown circuitries. The IC is available in multiwatt 15V and multiwatt 15H packages. The supply voltage range is +/- 10V to =/-40V DC. Heat sink is required and its thermal resistance should be around 0.038 degree Celsius/Watt. Use an 8 Ohm 150W speaker as the load. For 100W output the supply voltage must be +/-38VDC. The power supply must be well filtered and free of ripples. If ripples are present in the power supply it may cause oscillations. VM = 1.5V is the mute ON threshold and VM=3.5V is the mute OFF threshold. VSTBY = 1.5V is the standby on threshold and VSTBY = 3.5V is the standby OFF threshold. Typical input resistance of TDA7294 is 100KiloOhm. Frequency response is 20Hz to 20KHz. 145 degree Celsius is the threshold for thermal shutdown. Slew rate of TDA7294 is 10V/microsecond and the open loop voltage gain is 80 dB. Quiescent current of TDA7294 is approximately 30mA and its maximum value is 65mA. 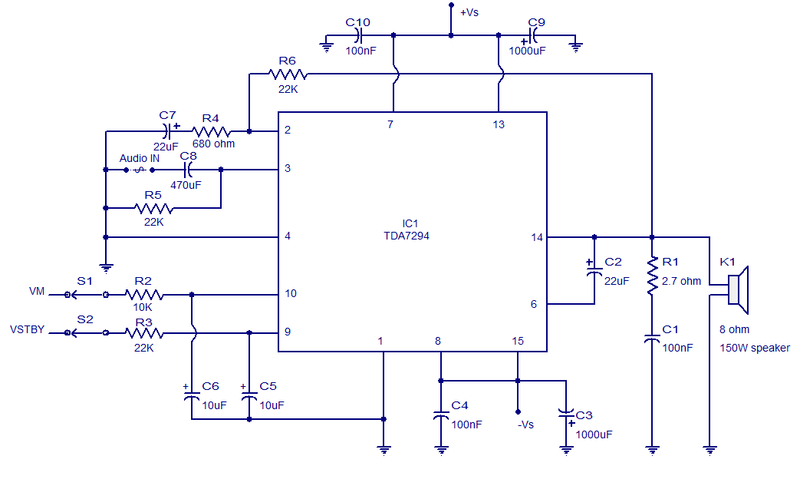 -Do you have +/- 38v power supply circuit diagram for the amplifier circuit. -is there any way i can use the same circuit to power a 4 ohm speaker. Can i use Â±45v 5 ampere ??? this circuit work 100% ?, because im trying to make one of these. I am confused as to which amplifier circuit I should assemble. TDA2030A in conjunction with BD249, BD250 output transistors, 120W output into 4 ohms load OR the TDA7294 based circuit. Kindly let me know about the i/p required, s/n ratio, distortion, low and high frequency response etc. Comparison. This design is inefficient. A much more efficient design is published in the datasheet for this component on page 10. You need to look at the datasheet, it shows how to connect them. Try this 300W Hi-Fi mosfet amplifierÂ http://adf.ly/vNFeoÂ the is superb. It can be used in bridged mode. It will around 150watts RMS into 8 ohms load. 4ohms load not recommended. Hello sir, i need circuit diagram to get 38vdc out of 2x24vac Supply if you can help me please? Hi Yesh It is not directly possible without driver and output transformers with 12 volt DC supply (like output stage in a PA Amplifier). With only a driver transformer and two darlinton power transistors or Mosfet transistors and a switched mode power supply of 12 VDC to plus minus 45 volts DC @ 5amps you can achieve 200 to 250 watts. pls sir can u post a tda7560 (50×4 watt) circuit diagram? You will get 70 watts RMS into 4 ohms load at 0.5% and 85 Watts RMS into 4 ohms load at 10% distortion. Hi folks, I’ve spent some time -nights- with 7294, asking it for 100 watts. It totally refused to do so. +/- 24 V at the rails you get 25 W over 4 Ohms – and that’s it. Higher voltage, more load (<4 Ohms) – you always get 25 Watts. This IC blushes in stage fright. But I was successful: ST itself offers a much more sophisticated circuitry in their datasheet and i managed to build it and to make it yell 110 Watts over 4 Ohms. +/-25 V AND! +/-50 Volts, added eight transistors and so on? Everything well painted on a double layer pcb postcard? I don't need that staying with my old 2n6609 and 2n3773. If the ic would have been broken , would anything in the circuit burn up with power connected? Yes the ic is cracked means some portion of electronic chip is damaged. Should gnd be connected to the chassi and the gnd in the ac socket? Gnd indicates a common 0 volt line to power supply and the power supply zero volt, in turn to be connected to chassis at the input socket of the amplifier only (Please note only one point earthing is alone allowed to avoid hum loop etc). A 1.2 + 1.5 in series? I dunno, what resistors can you get? Actually it shouldn’t matter. I’m assuming it’s a high-pass filter. Just use something around 2.7. 3 or 4 should be fine. Seetharaman, i need a tone control circuit for this 100W amplifeir, but the tone control circuit i saw in this site uses +15V -15V power supply. But the 100w amplifeir needs +38V -38V Power supply.. My question is, if I CONNECT THE TONE CONTROL TO THE AMPLIFIER, will the -38V +38V POWER SUPPLY BE TOO MUCH FOR THE TONE CONTROL? Hi Rex the transformer should be 27-0-27 with 150VA rating. Each winding should be capable of 2.5Amp to take care of surge requirement. You can use 3 amp rectifier itself. But I prefer you to use 6A10 6 amp rectifier capable of 400PIV. sir, I tried both u r 100w circuits (sub woofer also). I would like to install this in my car. 12v to 36v converter smps is pricing too much. pls post a affordable circuit if possible. Hi, ive patched up my circuit but it doesnt work at all, i followed the circuit diagram with all the right components. All the signals at the individual pins are correct, just that there isnt any output signal at pin 14. Couldn’t understand what could be the problem. i connect pin 9 and 10 to 3.5v individually. Please do get back to me. Using it for a project. Hj Ace 8 ohms 100 watts is sufficient. Still we recommend higher wattage since sudden peak power after a small pass can damage the speaker. If volume level is kept low and operate you can use even lower power speakers, but ensure that you operate at lower volume levels. use a suitable speaker protection like fast acting fuse etc. Hi,if i were to patch up my circuit onto a breadboard first, isit a must to install heatsink onto it too?? do you have the PCB schematic layout for this circuit?appreciate it alot. hi is it a must to use 8OHMS 150W rating speaker? any lower won’t work?? Hi this IC cannot operate with single supply as the protection circuits cannot function. Bridging is possible but dual supply is a must. see the following link. So,what I must to do…. Hallo 12 volt to plus minus 35 volt switched power supplies are available use one of them. how do you connect and use vm and v stand by? This circuit very use full . Please tell me a tone control for this power amp. Hi Yugandaraj you can use 12 volt transformer generate both plus and minus voltage from it. it will give you approximately plus minus 16volt and with 4 ohms loud speaker the out put power will be around 30watts. Can i use this circuit at 12V , 12 A ?? does it work ?? Hi Mansoor Pin No 9 and 10 should be connected to +20volt for playing and zero for muting or to keep the amplifier on standby. Tried it, it sounds so awesome, the ic is pretty expensive here though. Please Explane The Circuites 9 and 10 Pin Connection. Hi Ramdas the recommended operating point of the amplifier is with plus minus 35 volts DC the power delivered will be 70 Watts RMS into 8 Ohms load with a distortion of 0.5% for plus minus 35 volts DC you have use a transformer with a rating of 25-0-25 volts @ 3 to 4 amps per channel. Hi Alex the absolute maximum voltage allowed is + & – 40volts with 30 volts transformer you will get 42 volts. The recommended voltage for 8 ohms speaker safe operation is 25 – 0 – 25volt 3 to 4 amps transformer. can we implement this circuit on zero pcb? Hi You can build this logic, in sequence, in discrete digital ICs and connect the output through proper interface (drivers) to the individual equipment. I tried building this amp and was successful. only when I try to install volume pot, since the first pin of the pot is connected to the chasis ground. I get a ground loop hum. If I connect the source directly to the amp there is no hum. Please suggest on how to connect a volume pot. How do I design a circuit that works when the main power fails On-line UPS starts, after battery gets low then the generator starts automatically untill the battery gets charged. when battery is fully charged the generator stops and power comes from the UPS till the battery goes low, when main supply comes if generator is running it should stop and UPS should charge from the main power supply. is it possible? Refer manufacturers catalog and application data book.